Success in school is directly tied to the degree to which children believe they are capable and independent. As we allow students to develop a meaningful degree of independence and self-discipline, we also set a pattern for a lifetime of good work habits and a sense of responsibility. Independence is an acquired skill that is nurtured in the Montessori classroom. With practice, skills are mastered and the young child beams with pride. To experience this kind of success at such an early age is to build up a self-image as a successful person and leads the child to approach tasks with confidence and pride. Montessori classrooms and materials stimulate a child’s curiosity and motivation. 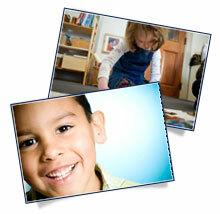 They offer a variety of experiences to support each child’s changing needs. Children spend a large portion of each school day moving freely from one activity to another. Many activities isolate one particular skill, allowing the young child to master it one step at a time. The materials are multi-sensory, sequential, self-correcting and fun! Working alone or with others, children choose their own materials and work at their own pace. Children learn to trust their ability to make decisions, a factor that figures greatly in the development of self-esteem.